What should I look for in a Rainwater Harvesting System? Because rainwater harvesting makes sense. Rainwater can be used for so many domestic and commercial purposes. It is free, clean and harvesting helps to fight the effects of climate change for both drought and flooding. Rainwater Harvesting is simple. Water from the roof is filtered and stored in the tank, from where it is pumped on demand to garden taps, washing machines and toilets. Rainwater is a free, natural, environmentally friendly resource. Rainwater Harvesting upholds all the ethics of Sustainability – Reduce, Recycle and Reuse. It acts as a cushion against future price increases by the Water Companies – future Hose Pipe Bans will not affect you. – Helps to reduce flash flooding – Easy to install. The most important thing is that the tank is made in one piece, NOT in two halves that are joined together. A one-piece tank cannot leak. The other important thing is that the pump is located in the tank, NOT the house where the noise it makes every time water is drawn can be very annoying. Pumps in the tanks PUMP water, which is what they are designed to do, whereas pumps in the house DRAW water which is inefficient as they were never designed to do this. Make sure that the system works even during a power cut as a lot of systems do not. It is well known that plastic has caused health problems in the past. Below is a list of possible health problems that can result from human over-exposure to the chemicals used in various types of plastics. Many rainwater harvesting tanks are made of Polyethylene. Polyethene & HD Polyethylene (PET, HDPE) are considered safe to use in normal conditions. HD Polyethylene #2 is the more durable of the two. However, these plastics may leach when exposed to UV, heat and over time from natural breakdown. The FDA deems this plastic to be safe but you should err on the side of safety as leaching will intensify over time – if bottles are made of polyethene, they are considered as a ONE USE ONLY bottle! If you intend your rainwater harvester to provide drinking water for livestock then think carefully about which type of tank you buy. Fibreglass rainwater tanks do not leach out. New research from Australia, where rainwater harvesting is very established, has revealed dangers related to plastic water storage tanks. A recent case of copper poisoning is said to be caused by acidic rainwater from plastic tanks corroding copper water pipes. There is nothing wrong with the water, however, rainwater collected in plastic and plastic lined water tanks is acidic and can react with the copper pipes that carry the water to your household taps. Dissolved copper in drinking water causes gastric problems and headaches, and in severe cases cirrhosis of the liver. We do not use rainwater for drinking in the UK, but care must be taken when using it for watering livestock, especially sheep to whom copper is especially toxic. The problem occurs when rainwater from plastic or plastic lined tanks sits for long periods in the copper pipes in the plumbing system. In that time the acidic rainwater can corrode the copper pipe and cause copper to leach into the water supply in the pipes. So the problem is worst after rainwater has been sitting in the copper pipes for a long time. It is advised that you flush the pipes before using any of the water, and this can be done by running a tap for 30 seconds or more, depending on the length of the copper piping in the system, or, simply, DON’T use plastic storage tanks! 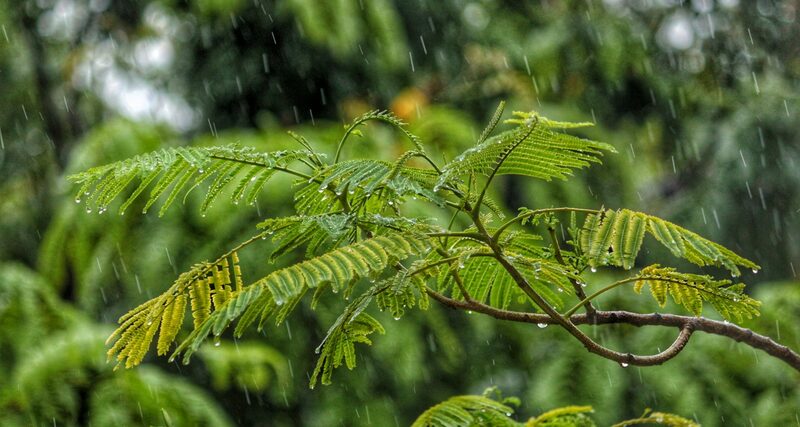 Is rainwater harvesting a new idea? Here in the UK we have always collected and stored rainwater for household use until recently when mains supply became the norm. Most houses had steel rainwater tanks, fed from the gutters, and the rain was used for laundry, washing-up, washing floors, and even for drinking by some people. In the early 1960s, my rural primary school had a rainwater tank which was the ONLY water supply for the whole school! Modern rainwater harvesting systems have only been seen in the UK since the Millenium, but in Germany, they have been popular for over 15 years. Water is a relatively expensive commodity in Germany, and rain harvesters are often grant-aided, so the market has grown rapidly. Many UK systems are German, but although the Germans use one-piece tanks, for ease of transport they ship them to the UK in two halves and they are assembled on-site. This vastly increases the potential for leaks. Are there any regulations governing rainwater harvesters? Rainwater harvesting has a new British Standard for the design of harvesting systems – the BS8515 2009. Many companies have yet to adapt their systems to meet these new regulations, so beware. Drainage is currently covered by the Building Regs. Section H which can affect rainwater harvesting system design eg. soakaway or city drain connections for the tank overflow. Other regulations, enforced by the water supplier, also apply. These are, in England and Wales the Water Supply Regulations 1999 (Water by-laws 2000 in Scotland and Water Supply (Water Quality) Regulations (Northern Ireland) 2002) The essential requirements of the regulations specific to rainwater harvesting are; (1) no cross bonding of rainwater piping with potable supply pipes (2) prevention of backflow to potable water supplies according to CEN EN1717 or air gaps type AA/AB/AC etc (3) the clear marking of rainwater pipes according to WRAS # 9-02-05 and (4) material specifications, where contact with wholesome water is permissible to meet the prevailing approved list. Which developments best suit the rainwater harvesting system? The full house system is designed for new-build as the cost of altering the plumbing of existing houses can be substantial. Existing properties can utilise the garden and outside loo and tap systems. If you are building an extension, then it is possible to use the full house system for any toilets there, as with new-build. The tank can be installed either at the groundworks stage or at the end, but the plumbing must be done at first fix. What drains can I connect to my rainwater harvester? Only connect the ROOF drains, Surface drains are too contaminated. How easy is it to install a rainwater harvester? What can I use rainwater for? At the moment, you can use rainwater for flushing toilets, doing domestic laundry (NOT commercial, nursing home, hospital, etc), washing cars, yards, paths, floors, irrigation, watering livestock, fire extinguishing, and most other non-potable purposes except bathing. Can I use rainwater for drinking? Not YET but WTE Ltd. is currently working on a system which will enable rainwater to be used for ALL purposes in the home, including DRINKING WATER! Not for Domestic use but for Commercial purposes, rainwater harvesters qualify for the Government ECA scheme, which provides rainwater harvester grants and allows the whole cost of the harvester to be offset against tax in the year that it was purchased. See your accountant. What is the maintenance required? The filter needs to be checked regularly for blockages, eg, leaves, as rainwater will by-pass the tank if the filter is blocked. Apart from that, the whole system needs checking once a year (like your central heating boiler) to see if anything requires replacing, but usually, the components should last about 10 years. Once every 7 years, the tank needs to be emptied (usually in a dry period when little water is inside) and the inside walls power washed. Hey, I'm Oliver. I started Garden List to not only share my experiences, but I also wanted to hopefully inspire a new generation of gardeners.